As written in last article my dad and myself had just returned from a bass fishing trip on Lake Guntersville in northeast Alabama. This lake is around 55 miles long and about 60,000 acres. Where does a person start? Yes maps do help along with GPS and a depth finder. But when you are on vacation you want to catch fish and have a place to start. This year we turned to a guide by the name of Brent Crow out of Hartselle,Alabama. Brent was a great guide and put us on fish from the start and the entire day. He picked us up at our cabin around 6:30 in the morning. Funny thing was it 64 degrees out and he was cold, I guess that happens when your from the south. We launched the boat and rode to a spot about 5 to 6 miles up the lake. We caught fish at the first spot. After fishing for a bit, we moved. He continued to take us to several spots through out the day. We caught fish if not at every spot, almost at all of them. Not only did he show us spots to hit, he also turned us on to a new soft plastic lure and furnished them as well along with the hooks. He even had my dad use one of his bait casting rod and reels. Brent was a very friendly and knowledgeable bass fisherman. He was a great person to hang with on the lake. If you hire a guide, not only is his knowledge important but also so is his personality. You don’t want to be stuck on a boat all day with someone you don’t get along with, and he had us on the water for nine hours. When it was done, my dad and I did not want to quit, we had a blast that day. Following our excursion our guide marked the spots we had fished on our map and then some other spots we could try as well. There were a couple of spots that he had put us on that produced fish the entire week, it was incredible. 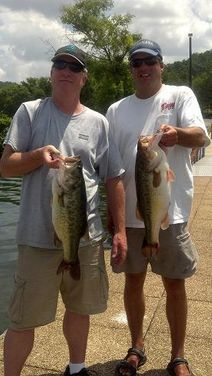 If you ever get a chance to fish Lake Guntersville and want to hire a guide I highly recommend contacting Brent Crow. 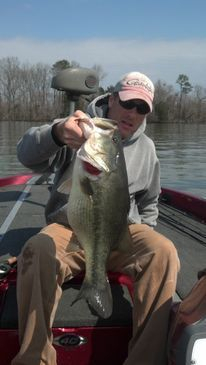 Check out his website at www.northalabamabass.com. He also guides on Smith Lake, Pickwick Lake, Wheeler Lake and Wilson Lake. I’ll second that motion! I have been with Brent on two separate trips. My reasoning for hiring a guide is to learn how to fish on some of the lakes nearby that i have prevously had little or no confidence in. If you just want to catch fish for a day and have fun, he will be glad to make sure you have a good day. If you want him to take more time teaching showing and explaining teqniqes, he’s your man in that area too. Both trips i have been with Brent on were not only very educational, but we also caught plenty of fish. Thats hard to beat in my book. Brent is a straightforward guy that isn’t on the boards telling fish stories to drum up business. He willingly posts his okay trip results right there with his stellar trips. He is willing to work with you on whatever skill level you are at and help you have fun and catch fish. Had a blast on Smith with Brent Crow today! have learned a lot in 2 trips with Brent. “Learned a lot” is an understatement. I read in a year. He does stuff that really works, especially in clear water.